Answer these simple questions to find the best Label to fit your needs. If you have any questions about this selector, or the products we carry, contact us. What is the brand of your printer? What model is your printer? Do you use a ribbon with your printer? 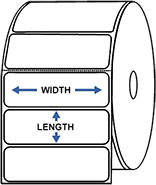 What material would you like your labels to be printed on? Don't see the sizes you're looking for? Tell us what you need here.